Don’t Let Success to Make You Feel Comfortable. So, what it is like? How do I perceive success or recognition? Isn’t it topping off my efforts? Nope! It is not… So, let me share with you how I look at success. 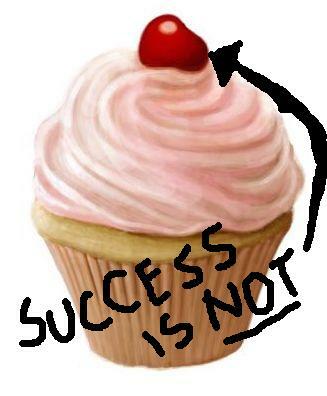 Success is not your “cherry on a cake”, success a spoon for serving your cake! What do I mean by it? Well, I was handed over a “spoon” (= endorsements from the world’s top thinkers on the subject of leadership), so I can serve “cake” (=my work/shipments/art) to the world with. Spoon allows me to offer & serve my work more effectively and comfortably, BUT essential part is not the “spoon” but quality of “cake” I will put on it. 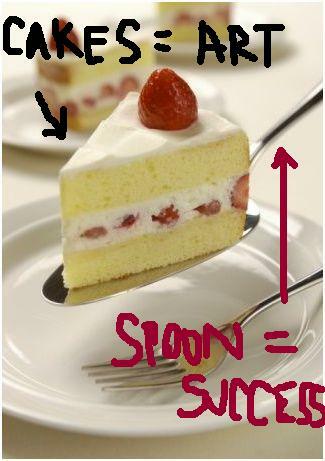 The only way how I and You can truly benefit from having this “spoon” (=success) at my disposal is that I will have a cake(s) for serving. And for that I have to keep “shipping” = working so I will not run out from cake(s)! Are you with me on what do I mean? It means not to settle down and sleep over your yesterday’s accomplishments. It means always stretching your abilities to ship better quality “cakes” each time you “bake”=work. It means being humble after any accomplishment, because without further production of cakes any number of spoons in your possession will be useless. what are your “cakes” which YOU serve to the world? Are you making sure that they are the best “cakes” you are able to “bake”? Or do you feel, that you can do better? What about your “spoons”= accomplishments from past, do they help you to serve your “cakes”= work/art in a better way? What is stopping you from creating the best “cakes” you can? I cannot wait to see your “yummi” comments! Great one Ivana as usual :-). It reminds me your life long lesson for me that “Dont settle and never stop learning. To start each day with “black canvas” is very beautiful thought. I am sure your success spoon will always be attached with your Art cake for us :-). What will I reach if I always chase success? What will I reach if I do not settle and never stop learning? I believe that the best answers for your questions would be your own answers. How will you get them? And you will see where will you reach. option 2- is the best thing, which has happened to me. ever!